This article first appeared in Personal Wealth, The Edge Malaysia Weekly, on October 16, 2017 - October 22, 2017. Bank deposits remained the most popular asset class among Asian households last year, with 45.3% of their gross financial assets invested in it, according to the Allianz Global Wealth Report 2017. According to the Sept 27 report, Malaysian households invested 43% of their gross financial assets in bank deposits, slightly lower than the region’s average. Also, 39% invested in insurance and pension funds while 18% invested in securities. In Japan, households held more than 50% of their financial assets in savings accounts. This comes as no surprise as an investor who had invested ¥100 in the Nikkei on Dec 31, 1999, would have had a return of only 0.06% at the end of last year. 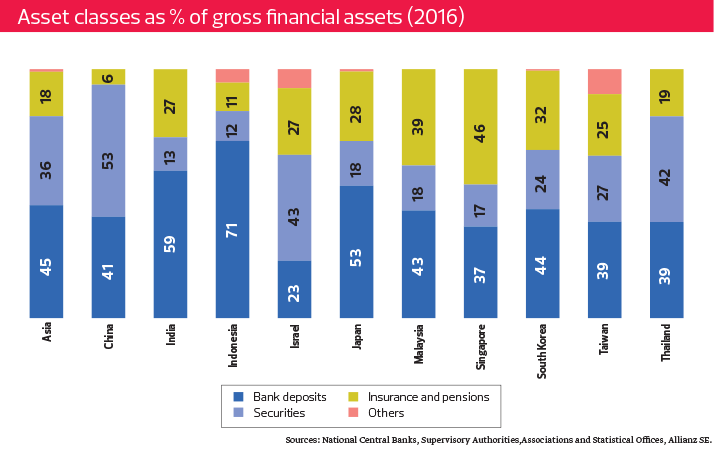 The share of bank deposits versus gross financial assets was also high in Indonesia and India, at 71% and 59% respectively. This was because the people in both countries had no alternative investment options and lacked access to the capital markets, according to the report. 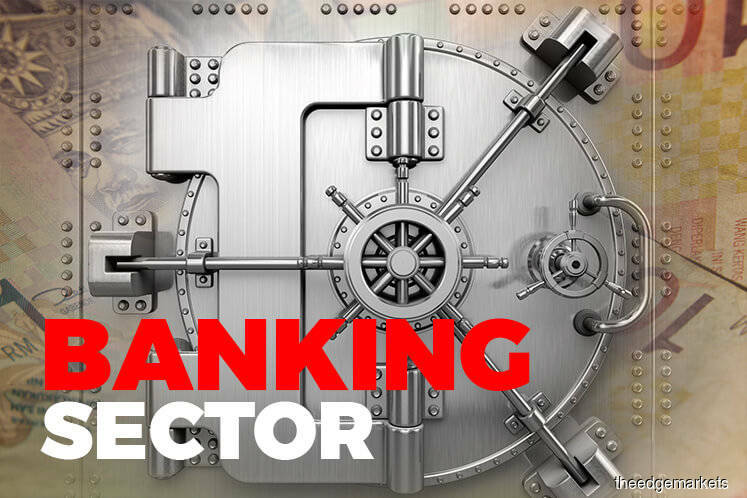 The report shows that last year, the Chinese had 53% of their gross financial assets invested in securities, 41% in bank deposits and 6% in insurance and pension funds. In recent years, some local economists have voiced concerns about Malaysia rapidly becoming an ageing society as early as 2030. Others have noted that the country will face severe issues arising from societal changes and a lack of comprehensive policies to address the ageing population issue. However, the Allianz report says Malaysia will not face a severe ageing issue until 2035. Citing United Nations estimates, the report notes that the number of people aged 65 and above in the country is set to double to 4.2 million by 2035, which equals 11% of the country’s population. In line with this, the old age dependency ratio (of those typically not in the labour force versus those in the labour force) is expected to hit 16% by that year. These figures, however, are not serious compared with its Asian peers. In China, for instance, the old age dependency ratio is already at 14%. By 2035, the number of people aged over 65 in China is expected to grow from 142 million to 299 million while the old age dependency ratio is anticipated to be more than 32%. This situation is expected to be worse in Singapore, Thailand, Taiwan, South Korea and Japan. 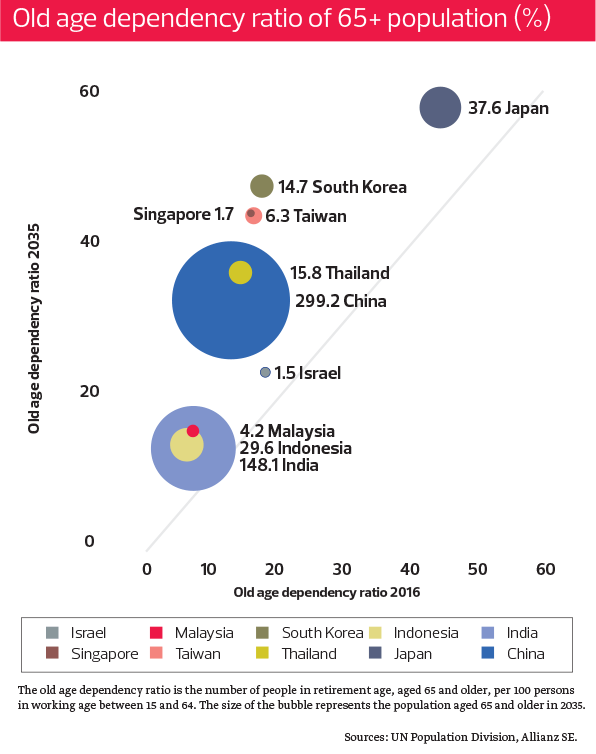 “Within the next 20 years, [the old age dependency ratio] is set to increase from around 17% to about 43% in Singapore and Taiwan; from 18% to just under 47% in South Korea; and from 15% to 36% in Thailand. In absolute terms, however, Japan will remain in the lead. Its old age dependency ratio is expected to climb from 44% to just under 57% by 2035,” says the report. The survey on which the report is based covered more than 50 countries globally to assess the asset and debt situations of different regions. At least 10 Asian countries were included in the survey, such as Singapore, Indonesia, Thailand, China, South Korea, Japan and India. Malaysia has a lower than average net financial assets per capita compared with its regional and global peers, says the Allianz Global Wealth Report 2017. According to the report, the country had net financial assets per capita of €7,750 last year — lower than the global average of €52,570 and regional average of €10,865. Nevertheless, Malaysians are still part of the “global wealth middle class”, defined by the report as having net financial assets per capita of €7,700 to €45,900. The report points out that the high level of private household debt, which equalled 88.5% of the country’s gross domestic product last year, was the key factor that dragged down its net financial assets per capita. 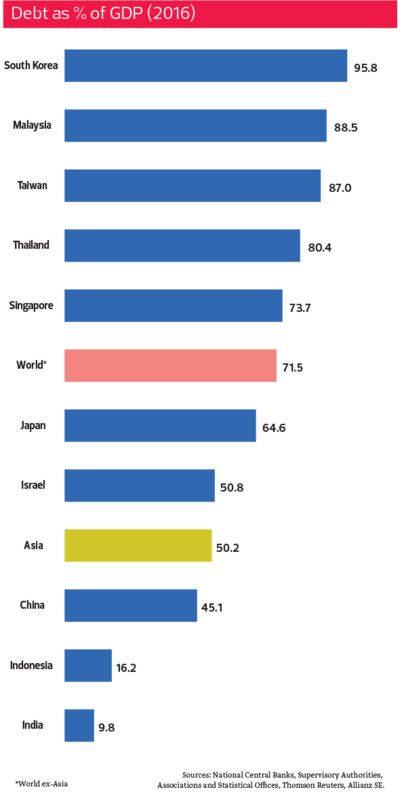 In fact, Malaysia has the second highest private household debt in Asia, falling just behind South Korea’s 95.8%. Globally, the private household debt-to-GDP ratio stood at 71.5% last year. Meanwhile, the gross financial assets per capita of Malaysia was €15,110 — higher than the region’s average of €14,410. It was also higher than those of Thailand (€7,755), India (€1,420) and Indonesia (€1,260), but lower than those of Singapore (€125,645), Taiwan (€111,305) and South Korea (€52,380). Malaysia’s gross financial assets per capita grew0 5.4% last year and at a compound annual growth rate of 9.1% between 2006 and 2016. “China overtook Malaysia for the first time in terms of gross financial assets per capita last year,” notes the report. 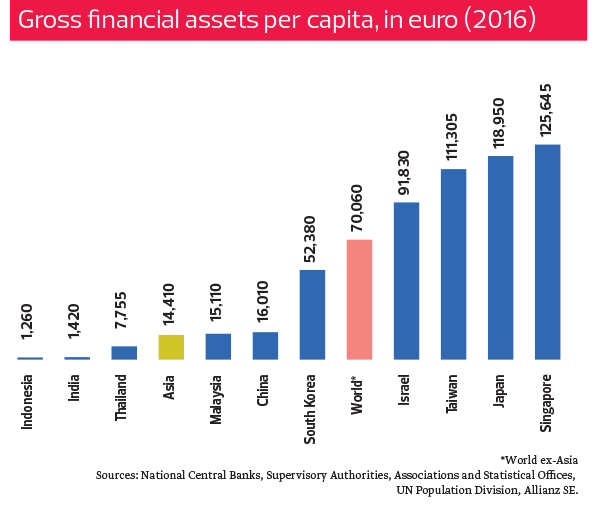 China had a gross financial assets per capita of €16,010 — about €900 higher than Malaysia’s.